Played on September 8 & 9, 2018. 336 moves. White wins by 2 1/2 points. White plays the attack on the corner at 6 to counter Black’s intentions. Nonetheless, Black plays at 7 all the same, now making this move as a pincer against White 6. White 8 and 10 are played as forcing moves. Black has little choice but to jump at 11, so White can then invade the upper right corner at the 3-3 point to take profit. This is surprising because White has been leaving weaknesses all over the board. 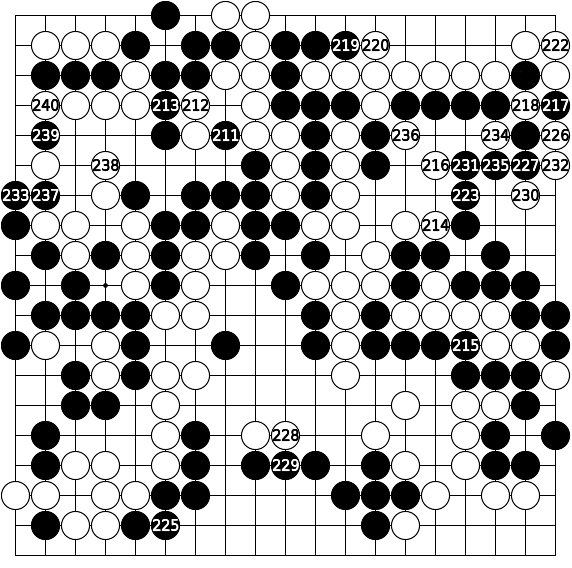 After White 18 in the upper right, Black pushes up at 19, making territory on the right side and exposing the three White stones below to danger. How should White meet this threat? Iyama chooses to do so aggressively. White 20 and 22 are forcing moves. 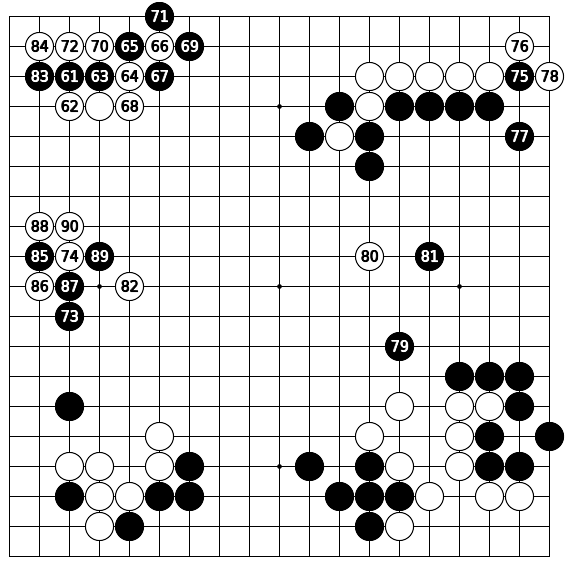 They leave behind defects that the opponent can take advantage of, but if the action gets fast and furious, it might be impossible for that to be exploited. Iyama is a master of this kind of tactical weapon. Then White turns to the lower right corner. White 24 and 26 keep the group there safe for the moment. With nothing better to do, Black attacks the lower left corner for the second time at 27. 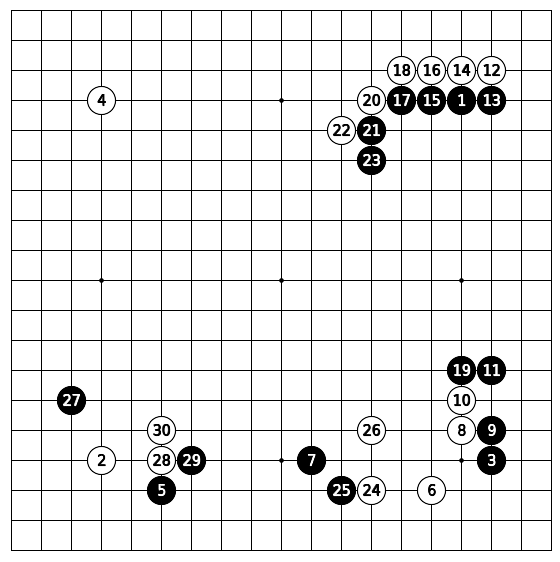 White’s earlier moves, including 20, 22, 24 and 26, may be characterized as sabaki (dealing lightly with a difficulty to tide over the problem), but now White must face the consequences. Black is poised to attack. Now is when then accounts are settled. Black starts by attacking White’s stones in the lower right with the hane at 31. But that is not such a dangerous move against White. 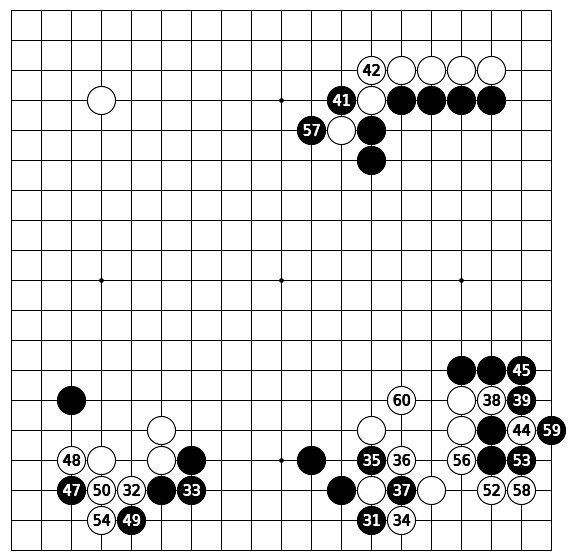 It is hard to question the judgment of such a fine player as Cho U, but surely it could have been foreseen that White 34 and 36 would be an ideal way for White to tide over the situation [shinogi] by means of ko. On the other hand, White is glad to settle the group with the moves through 60. This involves compromises, such as letting Black play the atari at 57 unanswered, but play there is still pending, while White has secured the left corner with the move at 54. Black 77 is played to take sente. White 78 is too good a move to pass up. But Black 77 is a serious concession, backing down. Black gets to play the move at 79, expanding the territory on the right side, but White can then make the neutralizing move at 80. 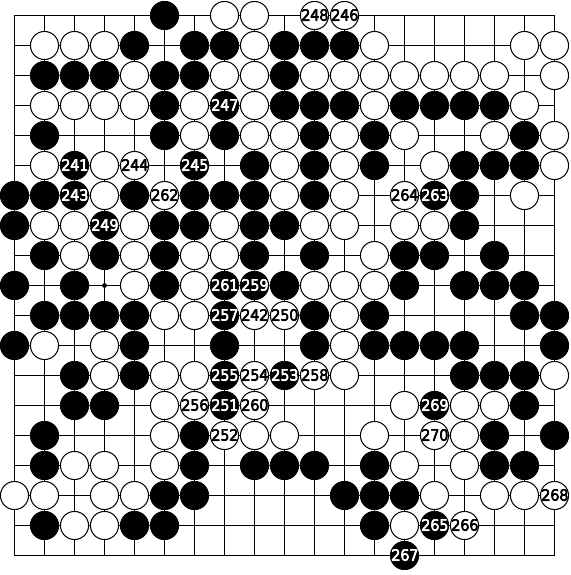 The reader is asked how many points Black loses by playing the move at 77? At a glance, the feeling is that the loss is 5 points. However, it depends on the follow-up. That is, which side gets to play first here. If White can make a one space jump to the point to the right of 77, the loss would be greater. What is more important is to convey to the reader the value of calculating how much moves are worth. White 82 may be considered the winning move. Black does not have a chance to win after this. 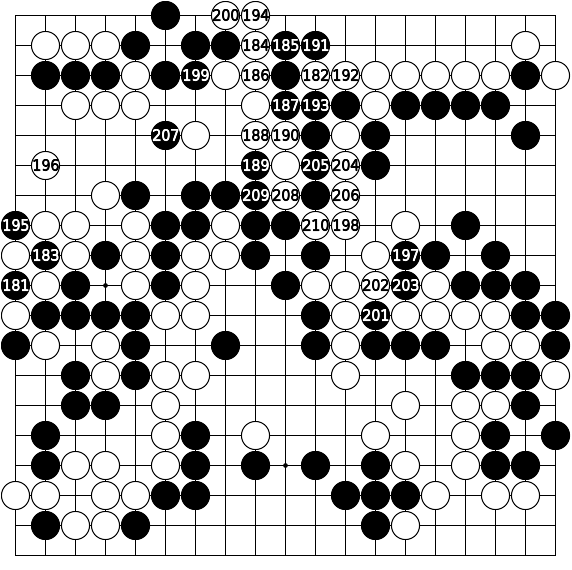 In this figure Black attempts to make an incursion against White’s territory on the left side. Through the moves up to 113, Black succeeds in that effort, but Black’s five stones at 95, 99, 101, 103 and 105 are quite vulnerable. This will make it hard for Black to win the game. 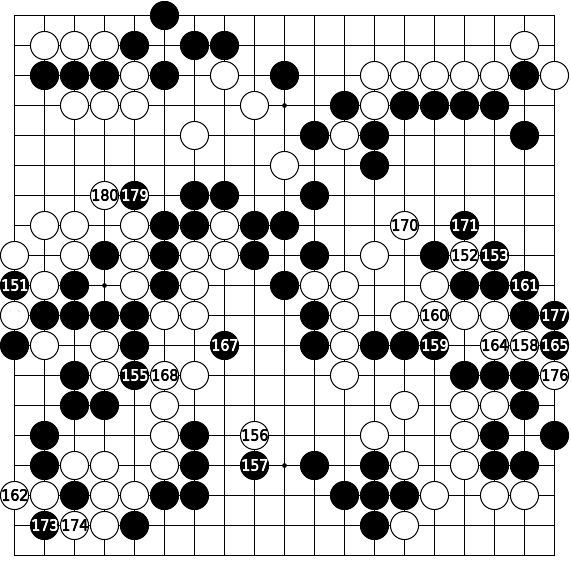 Note: Over the course of the moves of this figure, White gets to make the moves at 114 and 118. 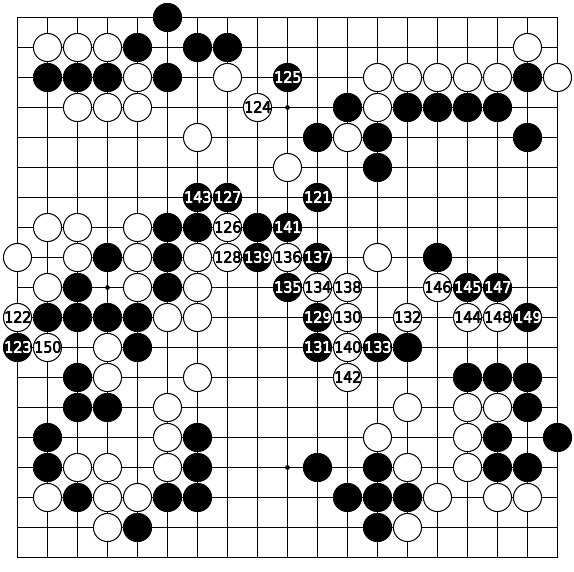 After that, does it appear that Black’s ponnuki on the upper side is worth 30 points? Black tries to take control of the right side with the move at 129, but there are too many defects in Black’s position to make this viable. With the moves through White 142, Black’s position is breached. White makes further incursions with the moves through 148. 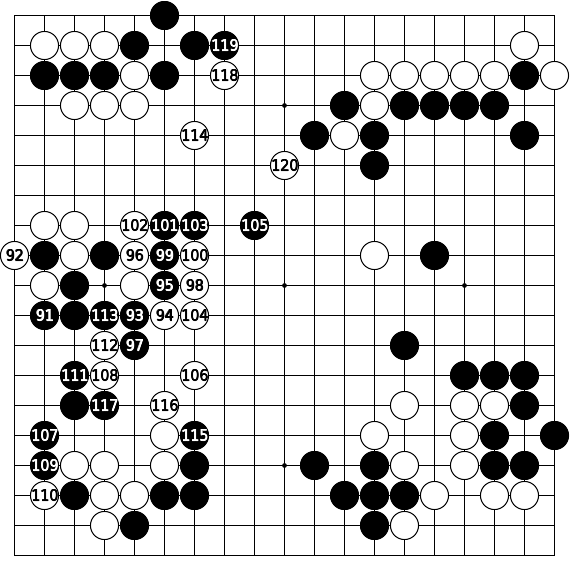 Then, Black has given way so passively that White cuts at 150 to finish off the game. The ko on the left side continues in this figure. The fact that Black plays so stubbornly to win this ko shows that White has the advantage at this point. 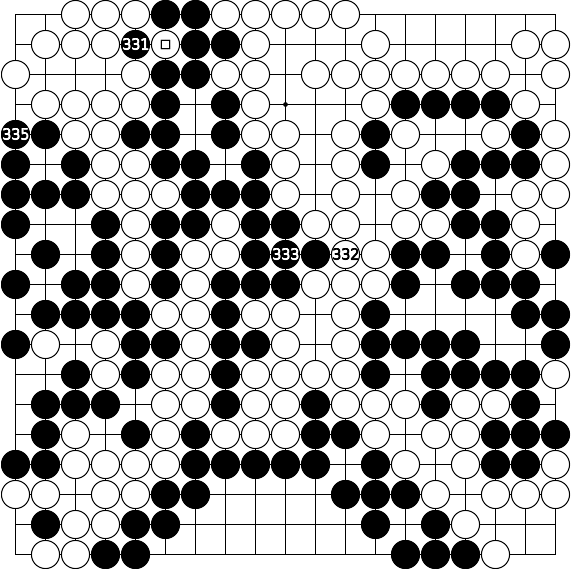 In this figure, the ko on the left side is resolved, although the board position remains complicated. Black’s nine stones in the middle of the upper side, including the stones of Black 185, 191, 187, etc., are captured by White, but it is not clear whether White can capture Black’s group to the left, including the stone at 199. 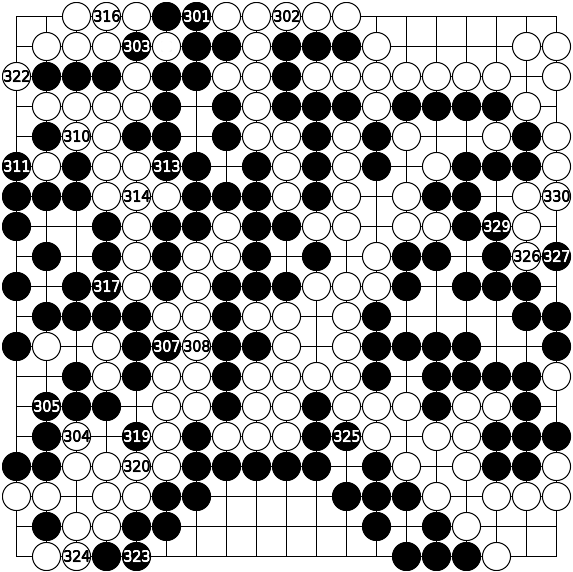 In this figure, the ko in the upper right is abandoned by Black because it cannot be won. White consequently makes a major incursion on the right side through White 230. 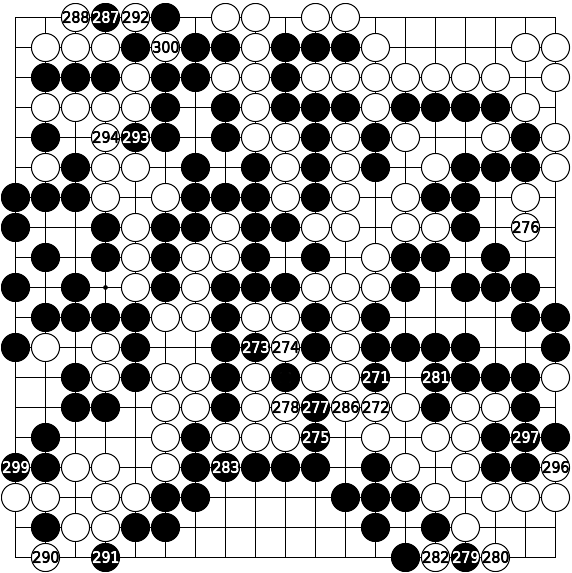 At the same time, Black reduces White’s territory in the upper left with the moves through 239. It is clear that play in the game is nip and tuck, and the outcome will be close. The endgame proceeds slowly in this figure. Each side tries to get the most out of the board position, but there is just so much to be gained from skillful play at this stage. The game is close, but White has a slight advantage. Both sides are grinding it out here, move by move. 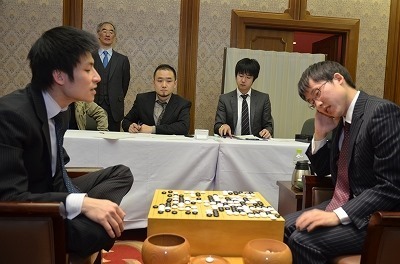 The outcome is clear, and both players understand this, but the loser (Cho) cannot just give up. How many other of us go players act the same way?! All of the endgame moves in this figure are worth only a point or less. The game is over. The moves are presented here just to finish things up.